We're serious about the spice in this recipe. Whole-grain pasta and tender shrimp pair perfectly with a luxuriously rich, piquant sauce. We're serious about the spice in this recipe. 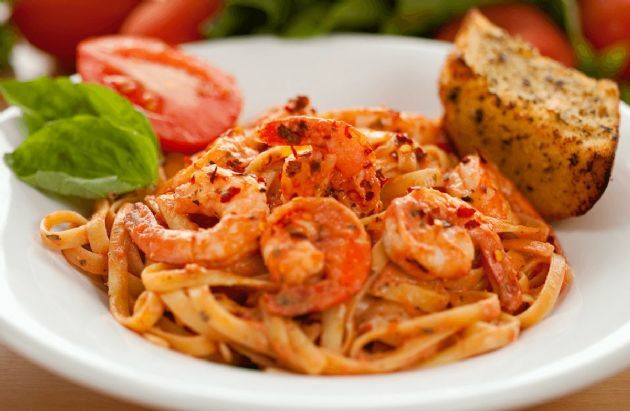 Whole-grain pasta and tender shrimp pair perfectly with a luxuriously rich, piquant sauce. * Found in the international aisle. You can also substitute tomato paste. ** You can substitute low-sodium chicken broth. I gave this recipe 5 stars, but wanted to point out that it doesn't reheat well. Something about the sauce consistency and fresh taste are damaged. So, I would suggest making this only when you are sure it will be eaten that day. The calory count is still very high for the portion size.